With two design thinking practices, you can make small, iterative changes to foster a creative culture in your school or classroom. This fall at the Hasso Plattner Institute of Design (aka the d.school)—where, until recently, I led the K12 Lab—we’re celebrating 10 years of exploring the role that design thinking can play in schools. In that time, we’ve learned a lot about building creative school cultures based on two essential design practices: changing your point of view and prototyping. Below are some of the most effective practices we’ve seen. Move your desk for a day. From a design perspective, we can’t improve schools unless we change our perspective on what is needed and what is possible. If you’re a leader, consider moving your desk out of the office and into the hall, library, or other common space. 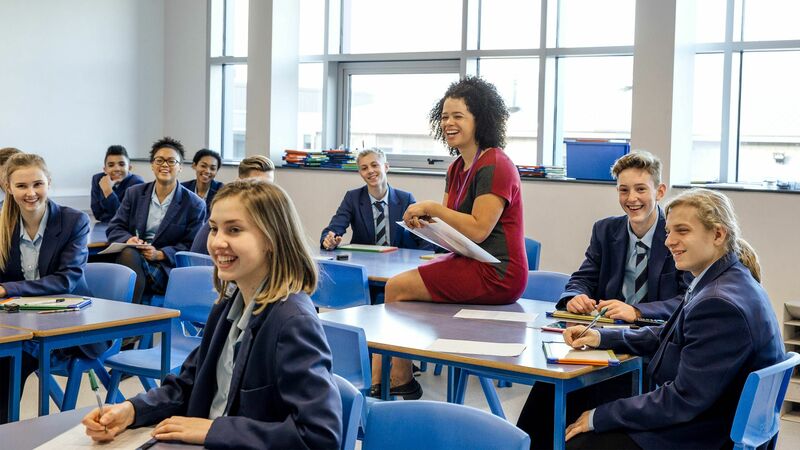 If you’re a teacher, perhaps you could try not having a desk in your teaching space at all. In either case, the power of this change comes from getting to interact with your community in new ways and helps you see your environment and your interactions afresh. 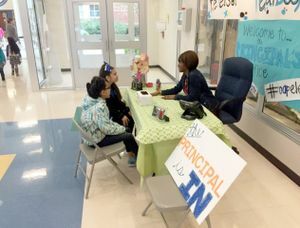 A principal chats with two elementary students in the school hallway. Shadow a student. Having now seen thousands of educators make time to participate in the Shadow a Student Challenge, we have come to insist on a shadowing day for the start of any school innovation project. What you see when you step into a student’s shoes will reset your understanding of what’s happening in their world and build urgency to respond to their needs. It will likely inspire you in unexpected ways. Let student voice lead the way. At every turn, you must literally ask yourself or your team: How might we put students at the center? For example, if you’re working on a new cafeteria flow, how might students engage students to design it? If you wish your students were more rigorous in their analysis of text, challenge them to select a text related to a topic they care about. Stating your goal in terms of a design principle helps everyone with clarity and inspires your design work. Apply your equity lens. We live in a world where racism, sexism, and systemic oppression of those furthest from opportunity are always present. When tackling entrenched legacies of oppression and inequity in our education system, it can often feel especially hard to get started. Start by asking yourself where racism, sexism, and other forms of oppression are most present in the system in which you teach or lead other educators. Map the system in order to consider where you can play a role in disruption. The K12 Lab and the National Equity Project have collaborated on some tools for intersecting design mindsets and equity work. Start small. The prototyping mindset helps us make ideas manifest, recognizing that we often learn best by doing and that the quicker we can learn what doesn’t work, the better off we are. To get started with prototyping, come up with the smallest possible experiment to see if you’re on the right track and avoid the tyranny of the rollout. Embrace the power of the pop-up. Have a half-baked idea for a new morning ritual or a new kind of school-wide assembly? What if you popped it up like a pop-up shop at the holidays? How about trying it in a corner of the entryway at drop off tomorrow? What if you invited a handful of students to test it out? The power of the pop-up is building something with urgency and inviting people in to give you feedback right away to see if you’re moving in the right direction. Show (and tell) your story. The only way to create big change from small prototypes and experiments is to rigorously observe and understand what you’re seeing. It’s important to share this process with others in order to learn. You can share photos and quotes with colleagues to hear their perspective on what seems promising and what was a flop. You can also set up a board with notes about what worked and what didn’t, and solicit school-wide feedback. Check out #shareyourlearning on Twitter for more ideas about how to bring these practices into your school community. As you embrace the mindsets of design, remember to use design to be brave. There is so much work to do. Whether you’re working on the redesign of a short lesson, doing a major project overhaul, or digging into the big questions around equity and inclusion in your community, don’t keep your progress or your prototyping fails to yourself. Design and innovation flourish in school cultures that value dialogue and adult learning. Sharing in and out of your building with folks that look like you and those that don’t will push your practice in powerful ways.